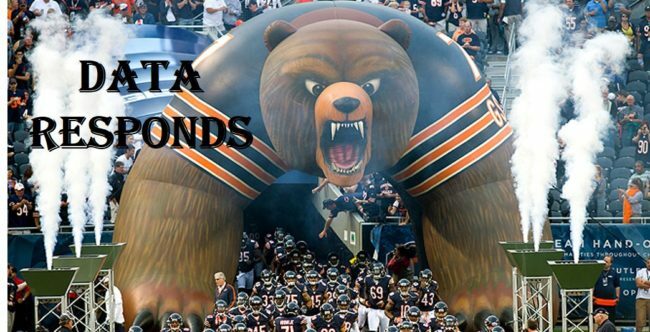 I always like the Chicago Bears. And I like this match-up. What’s Next For Mitch Trubisky? Let’s update last week’s areas of focus. The Roll Right, Cross-Body Throw. This was the most prominent “mistake” he made in his debut and he made it differently each time, culminating with the game-ending interception. (All three, interestingly, were throws to Zach Miller on plays that has essentially broken down.) Biscuit has to understand how much steam those throws lose and how quickly NFL defensive backs close on the football. Often the smart play is just tuck it and get a few yards with your legs or throw the ball into the sixteenth row. Grade: A+. Trubisky had a half dozen opportunities to make throws that were not there but chose instead to fling the ball to the sideline. Solid signs of maturity for a kid making his second professional start. The Left Side of the Field. Trubisky did most of his work to the right half of the field which, if you read this blog, was fully expected. But Baltimore defensive coordinator Dean Pees has been DC for Nick Saban (Michigan State, mid-90s) and Bill Belichick (New England, mid-2000s). Those men approach defensive football the same way. They want to take away the thing their opponent does best. Trubisky should have to open up the field Sunday. Grade: INC. The Bears did very little work on the left side of the field in the passing game because they did very little work in the passing game. They will not be able to run it 50+ times on this Carolina defense so Trubisky’s development will be entirely about how much more of the game is placed on his shoulders. Cadence. The offensive line never looked comfortable Monday night partly due to their being off the snap. They also had a few pre-snap penalties, with Charles Leno clearly not knowing the count on several plays, including the strip sack of Trubisky. Are those on the quarterback? Possibly. Only the players actually know. But it’s now on Trubisky to get this group comfortable and that only happens with time and experience. Grade: B+. The Bears took 80 offensive snaps in this game and were better pre-snap (zero penalties) and getting off the snap. Remarkably, as Brad Biggs reported, the Bears ran for four yards often on first down, even when facing run looks from Baltimore. That speaks to the toughness of Jordan Howard’s running but also the push from the guys up front. These odds are courtesy of the great Jimmy Shapiro, who emails the world weekly with various odds. This seems like it might happen regularly during the broadcast but really why would it? Once the game begins, unless Fox is visible in the crowd, why would the announcers think to mention him? I’ll take the UNDER and feel safe with no worse than a push. You’re getting 5 to 1 odds on him doing it so you have to take YES. If the Broncos win and Peyton Manning is speaking to Jim Nantz on the stage in a sea of confetti, can’t you see him dropping a reference or two to his “last game”? I can. Don’t load up here but it’s worth the gamble. NFL coaches all think what they do is special. They’re wrong. Football is not a complicated game and winning, by and large, still comes down to which team has the better players. Greg Olsen is a great player. Anybody with eyes knew he was beginning the process of becoming a great player in Chicago. And trading him away because he didn’t fit the system of an offensive coordinator was asinine then and is even more asinine now. If a coach can’t maximize the ability of a great player then the coach isn’t worth keeping around. You ESPECIALLY don’t trade players for coordinator fits because coordinators are always a good season away from leaving your organization. Players can only leave if you let them (or if they hate you). Who didn’t look at the Panthers receiving corps at the start of the season, following the injury to Kelvin Benjamin, and expect their offense to struggle? The answer is Panthers GM Dave Gettleman. Panthers defense was a force a year ago but something is rotten in the state of North Carolina. They are allowing 140 yards a game on the ground and have fewer sacks than the Bears (8-10) after doubling Chicago’s total in 2013. There is very little reason to believe the Bears offense won’t be able to build off their success against Green Bay, run the ball effectively and score quite a few points.